Most of the time I&apos;m a mum. But sometimes I&apos;m the mum of a special needs child. It&apos;s actually quite rare that I&apos;m fully aware that Audrey has special needs. It doesn&apos;t impact our day to day life as much as you might think. I recognise that she needs more help than her typical peers when it comes to various things (eating, navigating obstacles, potty training…), but I guess I&apos;m just used to her progressing slowly and she just seems a bit younger. I don&apos;t really think of her as "special needs" child. Audrey and I went to a mum event last month. Run by MumstheWordOnline, it was a talk and book signing with Clemmie Hooper, the midwife, mother and blogger who is "instafamous". I set off with Audrey in the sling, both giggly and excited by our alone time. Stopping to look at pretty flowers before we caught our bus to town. It&apos;s rare I can travel on a bus and sit Audrey next to me – sat up high so we can talk about what we can see out of the window. These are the parenting moments you drink in. Those perfect moments of excitement and happiness over the simplest things. We met our friends Louise and Harry and walked to the hotel venue. Audrey was snuggled into me and I could tell she was a bit sleepy. We collected our name badges and then entered the room. It was then that I realised bringing Audrey was a mistake (bringing Rex would have also been a mistake but for slightly different reasons, but I digress!). The mum chat volume was high. The room was crowded and chaotic, it was warm and everyone was moving around in limited space to chat and get coffee. Audrey was instantly asking to go home. 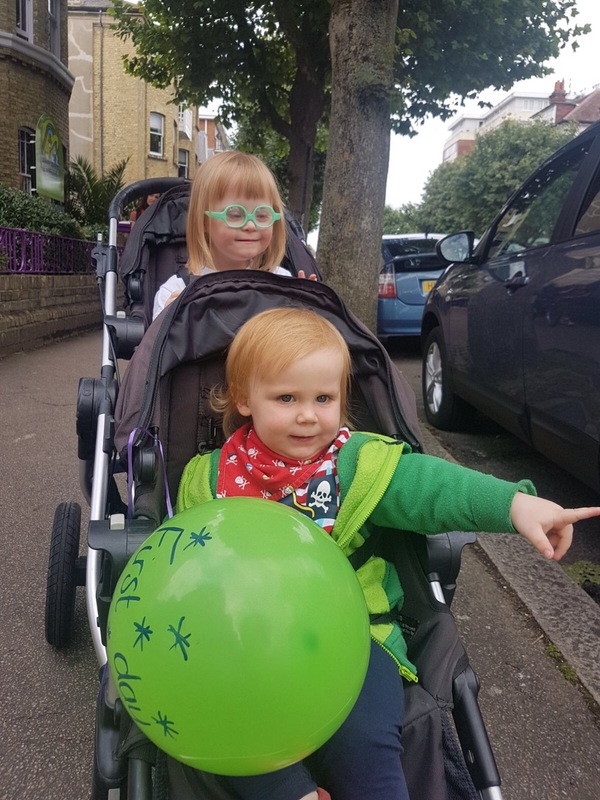 I thought that once we sat down to listen to Clemmie speak, Audrey might be content on my lap, but it soon became clear that wouldn&apos;t work – they had a PA system and Audrey covered her ears and said it was too loud. She started to cry. More than anything at that point, I felt so terrible having put her in this position. We moved to the play area but she didn&apos;t want to play with any toys, she just wanted to go home. At the very back there was a room for buggies. This was furthest away from the noise, Audrey was much calmer in this room, but basically wanted to leave via the fire exit because she could see the street. After a bit of back and forth, I realised it would be easily solved if we left. A brief freak-out (on her part, obv!) as we left through the main noisy room and then we were in the hotel lobby; she was immediately fine. We popped into the large toilet right there and Audrey said "Phew!" And was back to her usual happy self. We left and she was all waves and smiles to the hotel reception staff. We went to the library, then onto a cafe for lunch, Louise and Harry joined us, calm was restored. Lou tried to make me feel better by informing me Harry also asked to leave and handed her her handbag(! ), but the fact remains he wasn&apos;t emotional, he wasn&apos;t stressed, just bored. However it&apos;s moments when she&apos;s upset that I feel like a special needs parent. I feel eyes on me, I worry about pity, I think people see our life as hard. I feel like they see Audrey as difficult, as a burden and I hate that. I accept that she is different. Our life will be different. But I hate the thought of anyone seeing a fleeting moment of stress as "the way things are". These past few weeks have been tough. Not because Audrey has Down&apos;s Syndrome but because both my children have hit hideous phases of tantrums and tears and er, "wilfulness"! Two under 3 has been tough and despite the fact that Audrey is now 4, it&apos;s still very tough. The fact is, most of the time Rex is the main cause of stress, but he is typical and no one would bat an eyelid to his tantrums. Maybe no one bats an eyelid to Audrey&apos;s, but that&apos;s not how it feels when you are a special needs parent. Calm restored in a fancy toilet. I can hardly believe it, but I now have a 4 year old daughter! I&apos;m also wondering why mothers aren&apos;t always a blubbering mess on their kids&apos; birthdays. I started reminiscing days before her birthday and it&apos;s started to blow my mind that Audrey and Rex both grew inside my body. Woah. We had a rocky start with Audrey popping out all "extra-chromosomey" so the love we have and the way she is now is extra sweet. Our next big hurdle is potty training, which she&apos;s been potentially ready for for someone (a year maybe!) but I&apos;ve been putting off and putting off… but once we&apos;ve nailed that, wow, onwards and upwards for our grown-up girl. It&apos;s a funny time because Audrey&apos;s typical peers will be starting school in September (we have deferred her to be the oldest in her year next year), so it&apos;s strange that we aren&apos;t moving forward in that way. But Audrey needs the extra time and when I look at how far we have come since her 3rd birthday I know it&apos;s the right thing to do. Yesterday we had a great party (a BBQ at home), it rained half the time but we were ok inside. I made a chocolate peanut butter Hey Duggee cake and Daddy cooked lots of meat and made burger buns. Audrey got lots of lovely presents and was out like a light at bedtime, exhausted by a very fun day… the same couldn&apos;t be said for Rex unfortunately, he seems to get wired, but he fell asleep eventually. Happy birthday beautiful clever girl. Today I went back to work after 18 months of maternity leave (well, the cold, hard fact is, I was made redundant whilst on maternity leave, but let’s ignore that). As I walked home (that’s right, no dodgy commute, just a meander through leafy Hove), I felt so incredibly emotional. I’m a cry baby anyway (I’m sure I’ve mentioned my tearful John Lewis advert moments/sniffles at people dying on Neighbours/sobbing to La La Land? ), but this felt like such a mix of feelings. Rex spent an entire day cared for by nursery staff! – You see he’s only spent time with friends and family before, this was a big deal. Audrey is a nursery pro – she started at 10 months and save a few tears at pick up (when she realised we left her! ), she’s always been an easy-going sort; she took to it like a rubber ducky to kids’ bath time and we never looked back. Rex has been a bit more clingy in general and at 16 months he’s at a trickier age than she was, but, nursery settling sessions went well. So I wasn’t crazy-nervous about him starting and to be honest second time around you’re much more willing for your kids to fly or fall. But when lunchtime arrived I realised I was keen to check in and hear from nursery that he was having a good time (which he was). Once the day came to an end I was excited to get home to see my family. It was a good feeling because it is so rare that I get to miss Rex. Audrey has been going to nursery twice a week and on those days I get very excited for her to come home… clearly every day I cannot wait for my husband to get home, but for Rex… well we just don’t get very long breaks from one another to miss each other. What a novelty. I missed him. Amazing. In many ways I’m one of those mums that complains about how I’m always with my kids and that I have no time for me, but then doesn’t let others look after them. I fear leaving them, it’s a control thing and I’m working on it. Walking down the street alone on a mild summer evening was pretty awesome. I started daydreaming about dates with Ted, maybe going for a run; just time without kids that I haven’t “allowed” myself before. Getting home (5 minutes before my crew), I really got the “sight for sore eyes” phrase. Wow. My beautiful children arrived home with their Daddy, full of smiles and lots of shouting “Mummy! !”, it was wonderful. Rex was very clingy, but in such a lovely way and I got lots of cuddles and kisses. For anyone wondering if working (and this is only part time to be clear) after having children is a good idea… thinking; will you feel guilty? Will it be difficult to do something other than wipe bums and faces? Will my children suffer? Well, in my experience, working or just having a regular activity away from your children is a great idea (insert thumbs up emoji here). I just feel like I’ve had a boost and that both my children seemed lovelier because I didn’t spend the day with them! Ha. 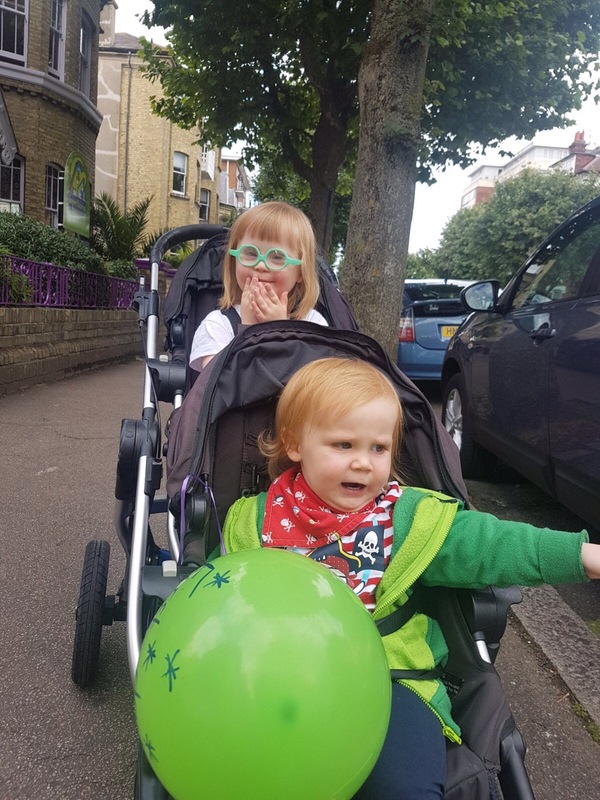 Check them out in pics below – Rexy got for a balloon on his first day and he loves balloons!